I’ve known Jodi for years. (She’s even reviewed products for us and run with us!) And, for years, she’s been killing it in the gym — tackling all kinds of workouts and classes and this girl is always game for a challenge. But in the kitchen? Welp, nutrition always seemed to be the one thing holding her back from having the body she wanted. 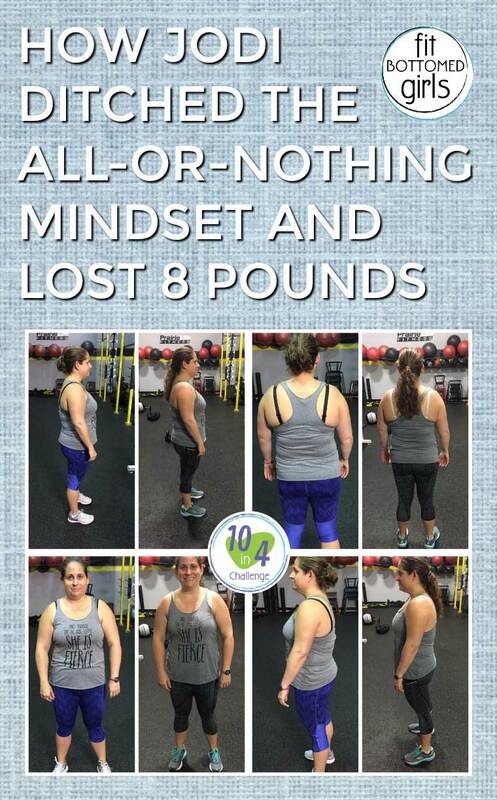 So, when we started our weight-loss with self love program — the 10 in 4 Challenge — I thought she’d be a perfect fit. FBG: What were your goals and expectations going into the 10 in 4 Challenge? Jodi: To get back on track with my eating and lose weight. What was the most helpful thing you learned/experienced during the month? Getting rid of the all-or-nothing mentality. It’s okay to make a bad food choice, but that doesn’t define you or need to continue. It’s just one meal. What was the thing that surprised you most about the challenge? I could live without dairy! I don’t like to live without it, but I can. Were your goals and expectations met? Yes, I lost 8 pounds, my clothes fit better and I’m back on track with my eating. I am continuing the program. If you could tell people who were interested in losing weight one thing about the challenge, what would it be? This is a plan that you can easily continue as a lifestyle. Many “diets” take away foods that cause you to binge when you are allowed to add them back. The fact that I knew I had two free meals kept me on plan during the week. Plus, the daily accountability in the group was a BIG help.